Branded phone accessories come in all shapes, sizes and designs. As promotional items and gifts they can be extremely useful for daily use, and with everyone using mobile phones in their daily lives, branded phone accessories will definitely aid in increasing your brand awareness and exposure. Here is one branded phone accessories these days are gradually becoming more and more unique. People want something that is different, and this Clip-on scientific phone microscope is sure to be a winner. The clip-on phone microscope is the perfect gift idea for anyone who loves scientific gadgets, and are perfect for investigating any object inside and outside your home, whether it be big or small. These microscopes can be easily attached to the top of your mobile device camera. What’s more it has a huge 30x magnification, which for a device this small is pretty impressive! 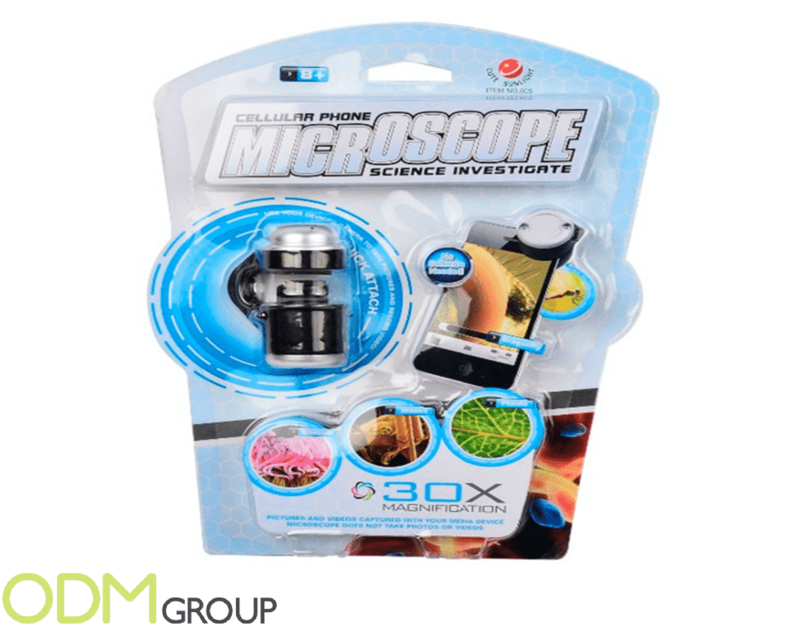 Why do branded phone accessories such as this phone microscope make great promo ideas? Great for using and are practical. These clip-on microscopes as branded phone accessories are a fun idea for anyone who wants to explore. Even if you receive this gift and may not be interested, it is one promo item that will be hard not to try out for yourself! Increasing product portfolio. These microscopes will for sure set your phone accessories out from your competitors if you introduce these into your brands products. Brand exposure. Phone microscopes are not often seen in everyday life. When friends, family or other potential customers see you using the microscope it will spark an interest. This interest means that will find your product interesting, and if branded they will remember in the future that your brand has some pretty cool items! Here at ODM we specialise in designing and manufacturing promotional items of all kinds. If interesting in creating your own clip-on phone microscope, branded phone accessories, or have any other questions about other promo items, please feel free to contact us. Here some other branded phone accessories from our previous blogs that you may find interesting.